Home » Big Local » Planters and Park It! A group of dedicated volunteers in Fishwick have recently managed to turn a historic find into something beautiful and beneficial for the future. 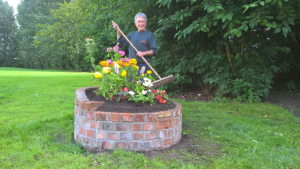 After excavations were carried out in the Fishwick Recreation Ground area, a kiln that went underground and had remained buried for many years was stumbled upon as a result. When it was further researched, it was discovered that bricks were formerly made on that site in the 19th and 20th century by J Topping & Son. Community groups and volunteers came together to build a planter from the bricks. In the foundations of the planter, they have buried a time capsule in the hopes it will be discovered by people of the future. It was Park Ranger Terry Blackburn and FOFS’ own treasurer Bob Fletcher who were behind the idea, due to their desire to commemorate the special value of the bricks and the history they hold. FOFS provided some money to go towards supplies that would help to build it, like sand, cement, soil, stones and the plants which eventually went in the planter. However, a significant portion of the money was donated to the group by the public. Brighter Blooms, a nursery, donated some extra bricks to the project, and the labour it took to build the planter was donated by the Vocational Centre. Inside the time capsule are documents about the Fishwick Nature Reserve, along with the Big Local plan on how FOFS plans to spend the £1 million lottery fund money. Martyn Rawlinson, councillor in the Fishwick ward, said that he is glad that now a bit of Preston’s rich history can be preserved permanently. Bob Fletcher looking very proud with the finished planter! In other news, on Friday the 12th of August, a Park It! event is being held on Ribbleton Park. It starts at 5pm and ends at 8pm. Everyone is welcome. Come along and bring your family and friends; there will be lots to do and see on the day. FOFS will have a stall and a gazebo there. We will be hosting giveaways, so make sure you give us a visit and check out what we have to offer! If you have any queries or questions, please feel free to email FOFS at fofspreston@gmail.com, where we will be happy to help you with whatever you need. Good Neighbour Award- Nominations now being taken!